Synopsis: No person can teach you what home you would like to live in, that will be up to you. What I can show you is what homes will increase the most in value. What homes could be gems in the rough that others may not see. How to determine what improvements will increase the value of your investment. Where to find properties which will be the best value. Ways to convince sellers to give you the best price. Which creative techniques you see on late night TV work and which do not. We will go over the terms and who all is involved in a sale of property. I will walk you through a nightmare example purchase so that you gain the experience and know what to watch out for. I will not be giving the forms you use, because frankly no form is universal, they are quickly outdated, and your escrow company will supply them for free. Whether you are looking for your own home to live in or a rental home to be an investment, you are making an investment. Knowing how to spot the pricing trends is paramount to get the best value and security. Based on US market, however concepts work everywhere. Paul E. Hunt. Esq. 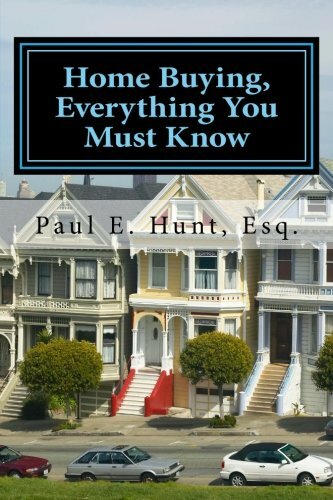 About the Author&colon; "Paul E. Hunt is a lawyer, professor, real estate broker and a contractor who has been in business for himself over 25 years including owning real estate sales offices, loan companies, a construction company, and managing over 500,000 square feet of property. He is known as an educated person who is able to talk to the general public in plain English without talking down to anyone. Professor Hunt teaches by creating examples that allow everyone to get a quick grasp of the information as he gently takes them to progressively more complicated material."